Balcome friends calling for support at frack off camp. Day 7 of blockades,camp going strong,more people, new energy needed now to resist. Frack-off.org.uk . North Carolina Gov. Pat McCrory is expected to sign a new law today that is being described as the nation’s harshest crackdown on voting rights. The new bill cuts early voting to one week, requires government-issued ID at the polls, ends same-day voter registration, and drops a program that helps high school students register to vote before their 18th birthdays. Asked about the elimination of the high school program at a news conference, McCory admitted he had not read that section of the bill. Mini bus to Balcombe frack site this Thursday from south west,organise transport in your area. Frack Free Somerset & Frack Free Dorset have organised a minibus to take people to Balcombe on Thursday evening. To reserve your place please email info@frackfreesomerset.org ASAP. Please write your name, number & number of seats and you Friday or Saturday preference. When: Thursday 1st August 2013, returning either Friday or Saturday evening. Please email with your preference. For the last 5 days the community in Balcombe, supported by people from across Sussex and further afield, has been fighting to stop fracking company Cuadrilla from drilling in their village. Cuadrilla will be attempting to bring more drilling equipment into the site. Large numbers of people are essential to prevent them from doing so. Please come down and support the people of Balcombe! If fracking is not nipped in the bud it will spread thousands of wells across Sussex and the rest the country. 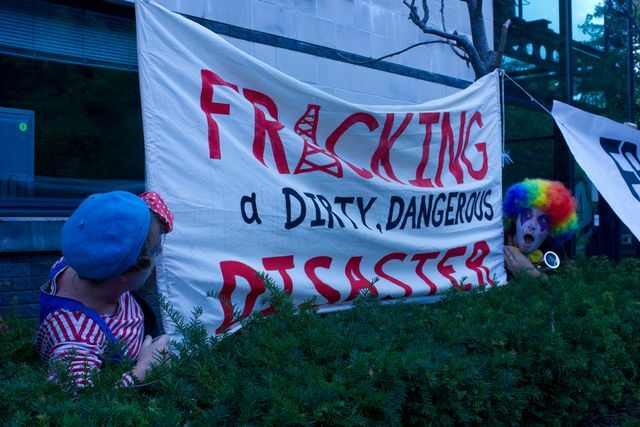 Confront the frackers now or one day they will be on your doorstep. Please bring essentials such as food, water, and appropriate clothing/sun protection. We will be camping on Thursday evening so please bring a sleeping bag/mat and a tent to share with friends. Don't worry if you don't have one, we can organise sharing. Try to avoid bringing alcohol, drugs, anything which could be construed as a weapon, glass etc. Cuadrilla, who are mired in planning issues in Lancashire where their first test well triggered an earthquake, are seeking to open a second front in Sussex. Cuadrilla's planned test well at Balcombe would be just the beginning of a tidal wave of destruction, sweeping across the South East. The licence blocks held by Cuadrilla and Celtique Energie in Sussex could see thousands of wells drilled and fracked, plus associated pipelines, compressor stations and processing plants. Dozens of people were detained over the weekend as part of the "Summer Heat" direct action campaign for environmental justice. At least 44 people were arrested on Sunday in a march on the Brayton Point coal plant in Somerset, Massachusetts. It’s one of several coal plants targeted by calls for closure and a transition to cleaner sources of energy. On Friday, 54 people were arrested after blockading the offices of the State Department contractor involved in assessing the environmental impact of the Keystone XL pipeline. The firm Environmental Resources Management, ERM, has come under scrutiny following the recent news it failed to disclose financial ties to the tar sands industry in Canada. In a statement, the group 350.org said the action was taken "to expose ERM’s corruption and conflicts of interest in having contractual relationships with Big Oil." SHAGHAYEGH TAJVIDI, TRNN PRODUCER: The largest industrial project in the world, the Canadian tar sands, looks as though it is about to get bigger. Alberta's energy regulator has recently given the green light to the expansion of Shell's Jackpine Mine five and a half years after the company first proposed the project. The mine is just one of ten new tar sands projects awaiting approval, though concerned indigenous communities and environmentalists argue that further development will exacerbate the already dire conditions of people and ecosystems in the region and beyond. Fracking is a nightmare! Toxic and radioactive water contamination. Severe air pollution. Tens of thousands of wells, pipelines and compressor stations devastating our countryside and blighting communities. All while accelerating climate change. And to produce expensive gas that will soon run out. So why do they want to do it? Just when we were all getting to grips with fracking, another mind-blowingly stupid and dangerous form of extreme energy extraction gains momentum. And it's no distant threat: licences have been sold for some time, 21 so far just off the coast in places like Swansea Bay, and now companies are boasting to investors that production is imminent. 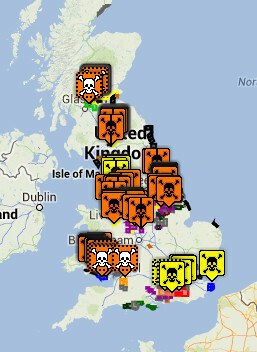 Watch out, Wales, Northumberland and Warwickshire among others. Burn, baby, burn – CO2 inferno! Hitlers bankers get away with it again. While we were at the Occupy London Bank of Ideas a UBS building,much information came out. That UBS funded Hitlers war machine until 1944,then when told to stop by the USA it carried on covertly into 1945. UBS worked with the SS and used concentration camp labour in some of its companies factories.UBS benefitted directly from the melting down of gold teeth from concentration camp victims. All this info is available online.Why are these banksters not shut down and jailed. Not to mention the Libor rigging manipulation, that we partly helped to expose through a press conference at the Bank of Ideas and some very hard work from activist researchers from Occupy London. 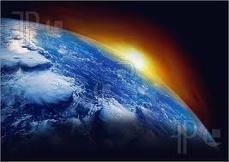 We’re already halfway through 2013 and the world continues to wake up to the fact that we are not alone in the universe. This year alone we’ve seen a tremendous step forward regarding UFO disclosure. In early May, researchers, activists, political leaders and high ranking military/agency personnel from around the world testified to the reality of the UFO/extraterrestrial phenomenon in front of several former United States members of congress. To watch an interview with the former 2008 presidential candidate and ex-congressman Mike Gravel (who participated in the hearings) click here. You can watch interviews with all of the senators that participated in the event here. 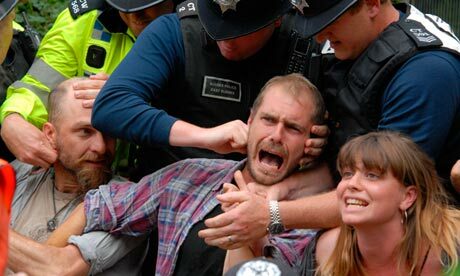 Sussex police have made 14 arrests at an oil drilling site near the village of Balcombe after local people and anti-fracking activists attempted to block the delivery of machinery for a second day using a human chain and tree trunks. Activists said police removed people who had blockaded the gates to the rural West Sussex site where the energy company Cuadrilla, headed by the former BP chief Lord Browne, intends to start test drilling for oil next week. Over this week I have argued why should march if you are a Unionist, an environmentalist or Maori – but what if you don’t fall into the immediate target list of people the GCSB will start spying on – why should you march today at 2pm? Because sooner or later my dear fellow New Zealander, you will be on this target list because the end point of the new GCSB Bill is the mass surveillance of every New Zealander, no matter how innocuous your actions. I urge those who have never been on a March to come to the protest today at 2pm – this one matters to every single one of us. One going out to all the old tree protest Tribe check these aerial adventures,probably take the bailiffs and climbers longer to get up in and evict them. Some incredible tree houses here,built with love and no eviction on the horizon. Roll on the Ewok tree village, viva the rebel Alliance, the Empire is crumbling. 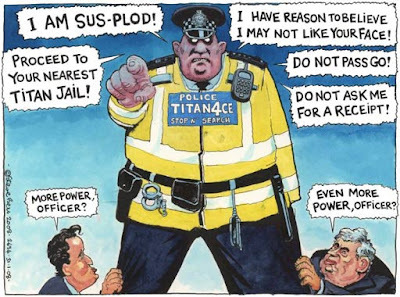 Another year – another crackdown on civil liberties. The appallingly derivativley named Crime and Anti-Social Behaviour Bill (somebody at the Home Office must have a bit of imagination surely?) proposes that the police be given the power to clear areas of people they “reasonably suspect” are engaged in conduct that contributes to “ members of the public in the locality being harassed, alarmed or distressed”. 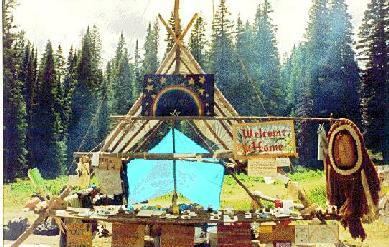 (100) Balcombe fracking camp continues - join us! 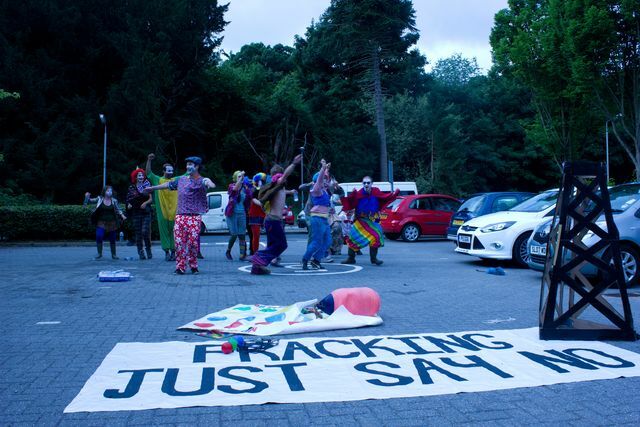 Balcombe fracking camp continues - join us! 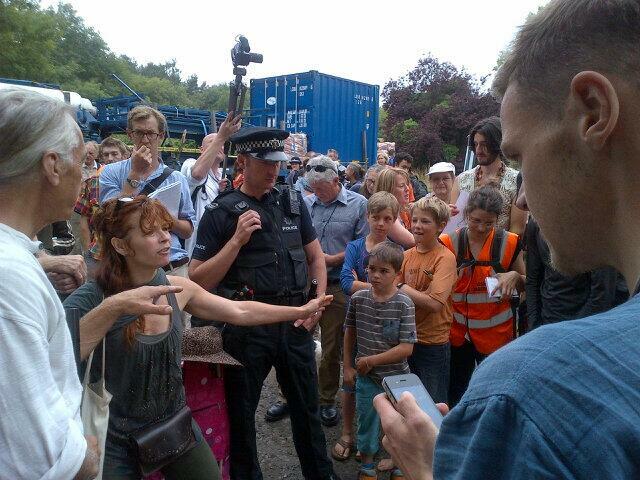 3.19: Cuadrilla Resources this afternoon smashed through the community blockade at Balcombe. With the assistance of one hundred police, the company forced it's tankers through the peaceful protest. The protests goes on. But wherever you are, show your solidarity for those fighting fracking in this tiny Sussex village and get to Balcombe. 25/7/13 - More than 40 people remain onsite tonight, now bedding down for the night. If you're planning on going tomorrow then the earlier the better. Cuadrilla's trucks arrived at 7am this morning; likely they'll do the same again, so the people onsite will need your support as early as possible. Meanwhile, the camp has produced a list of stuff they need: if you can help, they'd be very grateful. Work has come to a standstill at Fracking company Cuadrilla Resource's site in Balcombe, Sussex. As of 7.30am, activists blockading the road leading to the company's site have denied entrance to articulated trucks and work vehicles. 15 articulated vehicles are expected at 10am this morning, with tail-backs already visible in the village. The protest was organised under he name of The Great Gas Gala! and was called in response to an announcement from the Environment Agency and West Sussex County Council that Cuadrilla would start drilling as soon as Saturday. 'People are realising that if we are going to protect ourselves from this industry we are going to have to do it ourselves. After 5000 signatures on petitions and nearly a thousand objections being sent to the Environment Agency work is still going ahead'. 'We have tried other methods. We now have no choice but to take matters into our own hands and protect ourselves from the threat fracking poses to our health and environment'. Grow Heathrow is resisting the expansion of the airport. Meanwhile the transition town is also flourishing providing solutions towards the world’s energy and food problems. 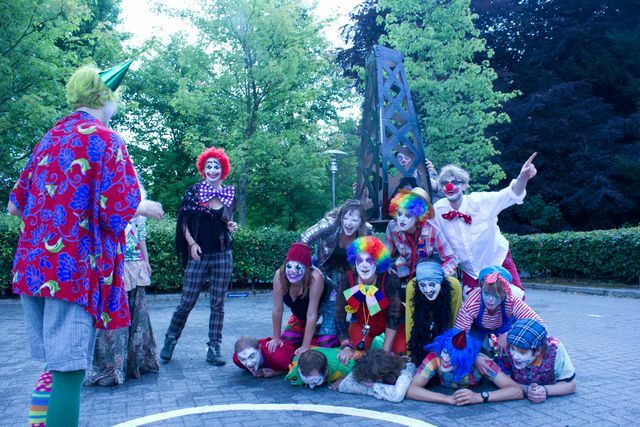 It is a working example, applying horizontal community organisation using consensus, amongst many other visions, plans and projects. But to keep focused, this article will explore some practical tips and ideas growing out of Heathrow. 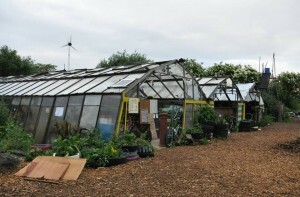 Grow Heathrow has transformed an ex-market garden, which it squatted in 2010. As part of the community of Sipson village, it stands against the expansion of the airport with its proposals for a third runway. The site welcomes visitors every day, which is the best way to see how much energy, creativity and inspiration. With their ambitious plans and innovative skills it is inspiring to consider where they will be in a further 3 years. Excellent article on Grow Heathrow Project. Showing a wide range of practical solutions. This occupied space is under imminent thtreat of eviction, so visit as soon as you can and dig in for victory. Full info and press release in the above link. Land occupations and growing food locally are one of the ways forward. Last Saturday (13th), hundreds of people joined a walk and Rally against Roadbuilding in East Sussex. There were guided walks along the route of the Bexhill Hastings Link Road, which started construction in January. After learning about the wildlife that is being destroyed and seeing the grim reality of roadbuilding, the walks all converged on the village of Crowhurst. The Great Gas Gala continues! Site is blocked and closed lets keep it that way. 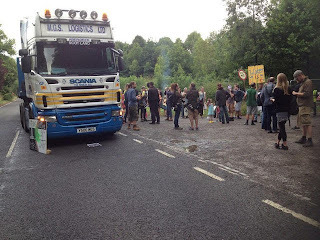 Free Bus from Brighton to Balcombe 7am tomrrw (friday) frm Old Stein bus stop (near RBS). 50 spaces. Pls forward! The final vote was 217 to 205, closer than expected. On the eve of the vote, the Obama administration deployed a lobbying effort to reject the bill, sending NSA director Keith Alexander to meet with lawmakers. In a separate vote, the House also rejected a measure that would have blocked funding for perpetual war under the 2001 act authorizing the so-called war on terror. This is a major push back against the virtual unlimited funds being given to the military industrial complex post 911. 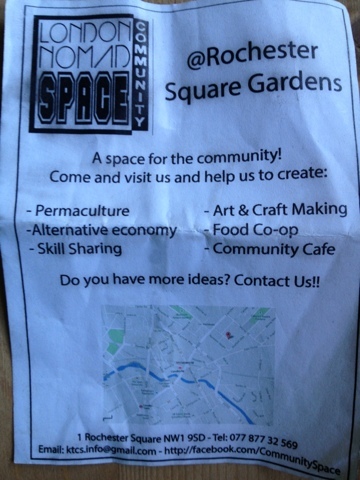 And gardening on Sundays 12-6 pm bring seeds plants n tools. Coming soon screen printing and self defence workshops. Grow Heathrow is recruiting! At the heart of resistance to the third runway in the village of Sipson, lies Grow Heathrow. At the heart of resistance to the third runway in the village of Sipson, lies Grow Heathrow. Here an alternative to the cancerous growth of tarmac and pollution is lived everyday. Each subversive seed planted by these guerilla gardeners inoculates the community and land against certain death. Each relationship established builds bridges of hope for life. Each heart that falls in love with the land is connected to a body willing to defend it. Amidst fresh proposals for a third and fourth runway, Grow Heathrow is under threat of eviction. We’re looking for bold spirits to occupy Grow Heathrow during the busy summer months. 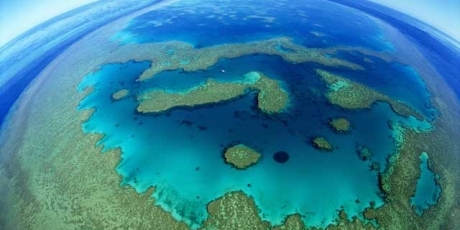 Some areas of land are not under threat of eviction and we need help to develop these as our defensive base. Whether it’s for a few days, a few weeks or a few months, your presence is welcome. We have restored three 40m long greenhouses where we grow vegetables, run workshops and host open days. We harness energy from two homemade wind turbines and some solar panels, have bicycle, metal and wood workshops, as well as a yurt and a straw bale house. And we’re organising with local residents to transform the Heathrow Villages into a radical self-sufficient community. Spread the word and email us at info@transitionheathrow.com to let us know when you’re thinking of coming. 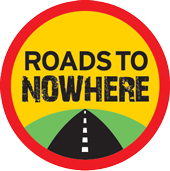 For more information, go to our website www.transitionheathrow.com. You can find us at Grow Heathrow, Vineries Close, Sipson, London UB7 0JG. Travel to West Drayton in TfL zone 6 in 20 minutes by train from Paddington, 30 minutes from Reading or Oxford. Go to www.transitionheathrow.com/directions for more details. Urgent! Action Pls forward. Drilling equipment arriving @ Balcombe. Mass-convergence frm 7am tmrrw (Thurs) @ site greatgasgala.org.uk. Urgent! Action Pls forward. Drilling equipment arriving @ Balcombe. Mass-convergence frm 7am tmrrw (Thurs) @ site, near Balcombe station. Map on greatgasgala.org.uk. A short briefing on the upcoming Operation Vendetta called by Anonymous hacktivists. Anonymous UK, as part of operation Vendetta, have planned to do a “Million Mask March” on November the 5th 2013 to Parliament from Trafalgar square starting at 6 pm. If London is not your cup of tea there are plenty of other locations to choose from, where other Million Mask Marches will be starting at the same time and date. You can pick from Nebraska, New Jersey, Washington, California, India, Colardo, Melbourne, Massachusetts, Bulgaria, Adelaide, Romania and Hong Kong. The aim of this demonstration is to re-unite all Anonymous activists and spark the movement back into action against the persecution of internet freedom. The demonstration is against government censorship and tyranny. For more information on the demo check here and you can also keep updated and follow events on their facebook and twitter.